View of Palestinian community Beit Jala in the foreground and the snaking annexation/separation wall in the distance around a settlement. Considering the political climate and the spotlight set on settlements in the West Bank I thought it might be helpful to shed more light on settlements in this week’s blog. Some of you may be wondering, what exactly are settlements and what’s the big deal? Who lives in settlements? How and why are settlements being built if they are illegal? How are people living in settlements affected by the occupation? How is their continued and growing presence contributing to the prolonging of the occupation? How are their Palestinian neighbors affected by their presence? To help set the scene I recommend first reading my other new blog post which is a recap of the resolutions passed (UN Security Council Resolution 2334 and House Resolution 11) and statements made by leaders such as Secretary of State John Kerry and Prime Minister Benjamin Netanyahu, and settlement investment activities by son-in-law and newly elected Senior Advisor to President-Elect Trump, Jared Kushner. What are settlements and How and Why are settlements being built? Israeli settlements are communities built by the State of Israel in the areas it occupied in the 1967 war, the West Bank and East Jerusalem, areas slated to be part of a future Palestinian state. Settlements were also built in Gaza, also occupied Palestinian territory, but they were removed in 2014. To some Jewish Israelis settlements are considered simply neighborhoods in suburbs of Jerusalem, cheaper than the city, newer, lovely, have full access to clean running water, and convenient, having their own access roads. Efrat, where I stayed for four days with a Zionist Orthodox Jewish family, was described to me by a resident as “a bedroom community”. Still to other Jewish Israelis, Zionists, and much of the global community settlements are seen as a political and religious statement. In the perspective of the Jewish people re-inhabiting the West Bank, or Judea and Samaria (as referred to by many Jewish Israelis and other Zionists who prefer its biblical names), they are embracing their sense of unique claim to the land supported by the belief of being God’s Chosen people. Biblically, the Chosen people are also referred to as Israelites, the people of Israel, a collection of tribes headed by the sons of Israel. Israel was formerly known as Jacob, then renamed and consecrated as Israel (Genesis 32:24-28), and is for whom the contemporary state is named. Being God’s Chosen people Israelites also believe they are entitled to a particular blessing from God which includes the promise of this land to them. One snag, however, is no one can confirm today who the descendants of Israelites are and thus, if speaking from this theological stance, it is impossible to determine who the land “belongs” to. An example being, I spoke to a Christian Palestinian who identified as an Israelite. His family heritage is Jewish and somewhere along the way they started following the teachings of the Jewish rabbi Jesus, whose followers then became known as Christians. Man walking his dog in a settlement just outside Jerusalem, West Bank, Palestine. Interestingly, though the official stance of the United States on settlements is they are illegal, the majority of the people living in settlements are/were Americans. Most were born in the U.S. and then made Aliyah (the religious term used for immigrating to Israel, lit. “To go up”). I wanted to learn more about the settlements and hear directly from residents about their reasons for leaving the U.S. and moving in particular to a settlement. I also wanted to hear what their engagements were like with their Palestinian neighbors. So, I took up the offer to stay with an American Jewish family, now Israeli, who live in Efrat to learn first-hand of their experiences. In my four short days with the family I was saturated with information, more than can be shared in one post, so look forward to more to come in the following weeks and months. But, here is a start. I was picked up by Daniel Zahavi-Asa and his high-school age son, Eliav, at a bus/hitchhiking stop on a roundabout intersection in the West Bank. The intersection was named after three Israeli youths who had been kidnapped and murdered by Palestinians in June of 2014. The attack was thought to have been done in response to a series of clashes including one that May which had led to the murder of two Palestinian youths by IDF soldiers near Ofer prison known as the Beitunia killings. I was familiar with the intersection for two reasons. The repercussion of the kidnappings and murders of the three Israeli youths in June was the murder of a Palestinian boy in July, who happened to be the cousin and nephew of friends of mine. More recently, I had become acquainted with the intersection when I had taken its eastern exit to go to Beit Fajj’ar, a Palestinian village where I had met with Hamsa, a 17-year old youth, who had just been released from Ofer prison after being taken from his home in a night raid by IDF soldiers earlier in the year. When Daniel and Eliav arrived I was welcomed with immense, energetic warmth from Daniel that matched his big, burly presence and robust personality. It was actually a bit shocking to be suddenly struck by such familiar, gregarious, loud American energy in such a foreign context. I was surrounded by street and business signs in Hebrew and Arabic, being passed by cars with yellow and white license plates indicating their Israeli or Palestinian residency status, all while standing a few feet from IDF soldiers guarding our bus stop with assault rifles slung over their soldiers and then there was Daniel. Even more strange were the mix of internal emotions I had in response to Daniel’s energy. I was overjoyed, even relieved by the affection and familiarity, meanwhile uncomfortable knowing this, too, was man who had made a conscious choice to live in a community whose very presence was inciting and illegal. I wondered, am I somehow being inauthentic to both like him as a person and strongly disagree with some of his crucial values and perspectives? I realized what I was appreciating was the beauty of his humanity and how it was shining through his personality, while simultaneously holding the truth that his beliefs and opinions did not consistently reflect the same warmth and kindness I was being given. This awareness pointed to a great truth about our human experience: our opinions and beliefs do largely shape who we are and how we live, but they are not the whole of who we are. If we desire true peace in this world we have to be willing to build relationships with people who we disagree with. We have to be open to the whole of who they are and seek out that part in which we can connect. If we do not endeavor to do this, we will only continue to become more fragmented and fearful and it will be futile. We must challenge ourselves to the ultimately rewarding task of respecting the fact each person has a voice and right to speak though we may disagree with it. With this we must commit to practicing the art – the challenging art – of engaging in conversations that are uncomfortable. Real conversations in which one party speaks and the other listens, not two parties talking at each other. Only if each party feels mutually heard and respected can there be hope of improvement. Such dialogues are our glimmers of hope for understanding, relationship, and peace. This requires love and compassion which we must generously nurture in ourselves so in turn we may be able to live out of these beautiful human virtues which, marvelously, are quite contagious. Efrat illegal settlement, West Bank, Palestine. We took the northern exit of the intersection and made our way to Efrat. It is about a 40-minute drive south of Bethlehem with 10,000 residents which is expected to increase to 15,000 in the next five years. It is also the headquarters for Ohr Torah Stone, an organization that runs a network of schools in Israel and the United States and a recipient of funding from the Kushner family who donated $5,000. We arrived at one of the entrances to Efrat where we were met by a soldier in a kiosk who lifted the automatic arm for us. As we wound our way up the hill along a well paved road we could hear the high pitched screeches and crashes of construction machinery working on "the new monstrosity", as Daniel described it--new homes for the thousands of residents expected to arrive in the coming months and years. The Zahavi-Asas live in a modest, two-story home on a hill overlooking one of the many valleys in the West Bank. From the balcony I could see surrounding hillsides, some covered in Palestinian crops among stone terraces others topped with sprawling settlement communities. Daniel Zahavi-Asa looks off his balcony onto a neighboring illegal settlement atop a hillside across the valley known is Hebrew as Gush Etzion in the West Bank, Palestine. The family knew about “Through The Checkpoint” and stated they were grateful I was coming to learn about their experience and get a fuller picture. I stayed with them for Shabbat and the beginning of the high holiday of Sukkot in October 2016 so in the midst of cooking and feasting I soaked up a breadth of information and experiences from Aviva, the mother who had extended the invitation to me, Daniel, Eliav, and Gavriella, one of their daughters. I was also introduced to a number of their neighbors, including, Rabbi Riskin, the prominent rabbi in the community who recently shared with the Israeli newspaper, Haaretz, his opinion on our presidential-elect and the controversial move of the U.S. embassy, "Trump," he said, "speaks very differently about Israel and our prime minister and supports the need to transfer the U.S. embassy here to Jerusalem, so I have a lot of hope." 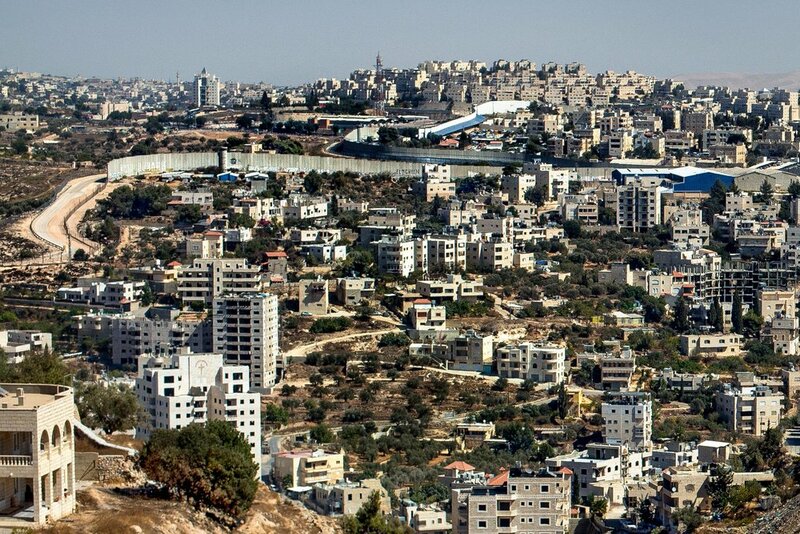 How are people living in settlements affected by the occupation? How are their Palestinian neighbors affected by their presence? I spoke with Khaled Abu Awwad, one of the original members of Parent Circle Family Forum and now helping his brother, Ali, establish a new organization Roots, which is working for reconciliation and relationships between Palestinians and Jewish Israelis. While Palestinians like Khaled and Jewish Israeli settlers like Andye Friedman, an Efrat resident very involved with Roots, are seeking to build relationships with each other, the relationships are fragile and ever-under threat of damage or deterioration with each instance of violence instigated by the others' community. Such efforts are also in the minority. The majority of people are skeptical, hesitant, resistant, or apathetic. As I learned from the broad scope of my travels and interviews, one's ethnicity, religion, region of birth, and region of current residency all contribute to the determination of which of these camps one falls into. I also learned it is a risk, especially for Palestinians in the West Bank, to build relationships with settlers because they are often criticized or condemned by their Palestinian community for doing so. This may be in part because Palestinian communities in closer proximity to settlements incur higher IDF attention, Gerard Horton from Military Court Watch explained to me. Hamsa from Beit Fajj'ar said 23 youths from his neighborhood had been taken from their homes in night raids, including two girls, the first I had heard of girls being taken. Some Palestinians also view relationship-building that is not directly working to address the problems of the occupation and ending the dehumanizing status quo as normalization of the occupation and its conditions, possibly even prolonging its end. How are the presence of settlements perpetuating the occupation and its injustices? With settlement blocs also come bypass roads which can be closed off to Palestinians without warning. They remain accessible only to Jewish Israeli settlers and some Palestinians with Israeli citizenship driving cars bearing Israeli license plates for indefinite amount of time. In addition to settlements the state of Israel continues to claim land in the West Bank, particularly Area C, and designate it exclusively for Israeli purposes such as restricted military zones, national parks and reserves, Israeli resorts, and agricultural areas for Israeli companies. As Secretary Kerry pointed out in his speech on December 23rd, “Almost no private Palestinian building is approved in Area C at all. Only one permit was issued by Israel in all of 2014 and 2015, while approvals for hundreds of settlement units were advanced during that same period. So, how can we respond? Join an organization like Jewish Voice For Peace or Institute for Middle East Understanding to stay up to date via email on news in Palestine/Israel and ways you can work for a just peace. May our hearts and minds be nurtured in love and opened more fully that we might courageously engage in conversations with people whom we fear, disagree with, even hate. That we might learn to forgive and be free. May we be transformed by love for the healing and wholeness of the world. May we grow in compassion that the world may increase with the compassion we truly desire than the negativity we harbor and spew out of anger because of how reality appears. May we maintain the dream of justice, equity, and peace, and live into this hope each day in small and grand ways that our dream may become reality locally and globally.